Outlines proper use of Federally registered NAL trademarks. This form is completed by League Commissioners to request consideration of an NAL rule change at the annual NAL Conference. Completed by League Commissioners to allow the use of photographs and other league information in newsletters and other NAL publications, and on the website. Completed by League Commissioners at the beginning of the season. Includes school district contact information, billing instructions, etc. Completed by League Commissioners at the beginning of the season. Includes a list of participating schools and coach information. Used to indicate availability during NAL National Tournament. Completed by League Commissioners and due the first Monday of each February. Completed by League Commissioners prior to the National Tournament, this form verifies that the students playing in the tournament are the same students that competed during the regular season. 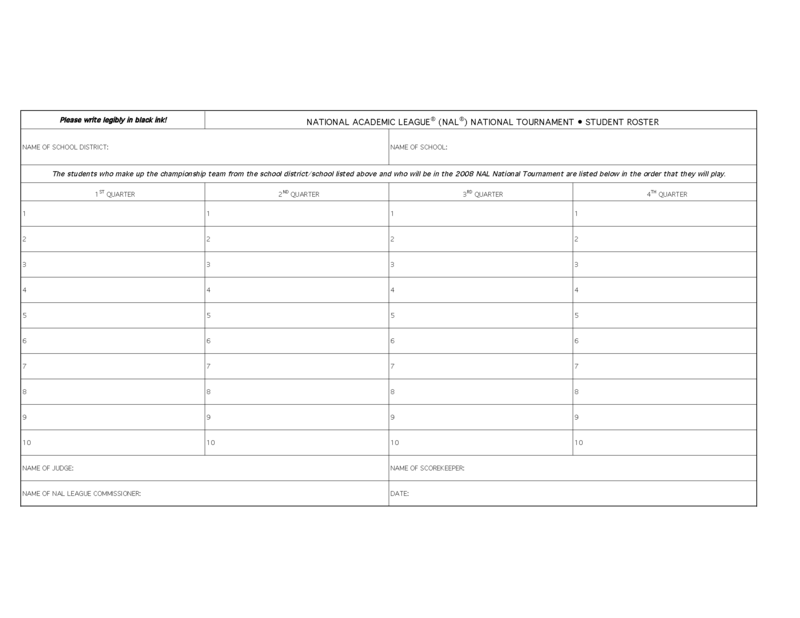 Completed by League Commissioners prior to each National Tournament game, this form lists students participating in each quarter of a tournament game. Once submitted, changes may not be made within 7 days of a scheduled game without the approval of the NAL National Office. National Tournament requirements to be submitted one week before the first game. Used to request Runner-up position in NAL National Tournament.